I did warn there may be a little bit of time in between parts I and II but I got there in the end. I realised today that if I don’t hurry up and post about Christmas it will be too far gone! 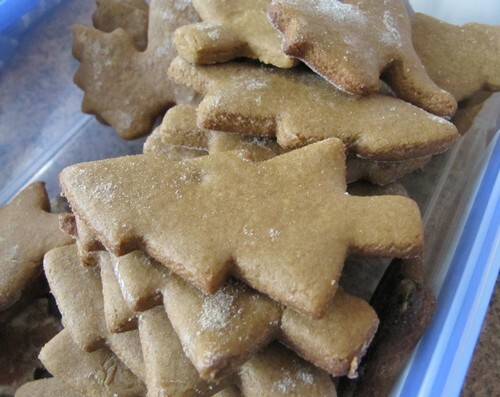 Liesl was correct – we did make gingerbread – too much gingerbread. We still have containers full! Gingerbread biscuits – recipe from here, label by me using a picture from here. Everything packaged up into brown paper bags with little handles. They were very well received and I’m looking forward to making next years! 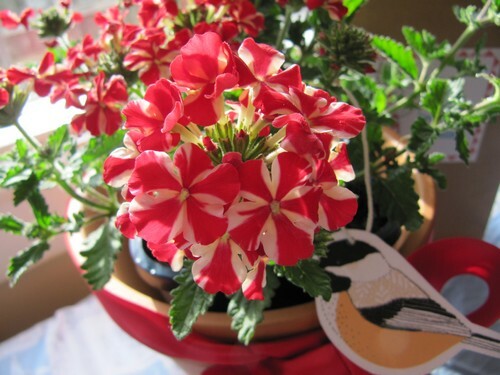 I love this verbena we gave to my mother in law. The colours are perfect for Christmas. I think I’ll get myself one too! The gorgeous bird tag was another generous internet freebie from here. I used the cardinal on my mum’s plant. While on the topic of tags, Jenny from from All Sorts was generous with her tags this year too. Aren’t they gorgeous! All in all I had a wonderful Christmas as always. The day was spent with family eating lots of yummy food! Yum! 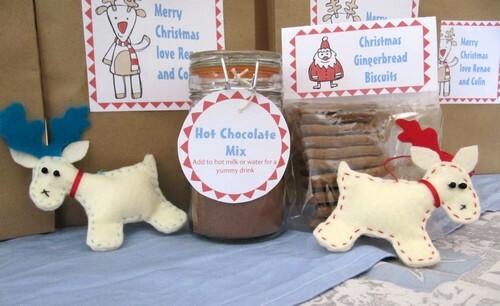 I’d much rather receive edible presents than more stuff – especially hot chocolate mix. Yes! I made sure my immediate family only gave me things I needed this year and asked the extended family not to worry about pressies. Pressies are fun, but then you have to find homes for them all! Oooooh, I love your Christmas packages … exactly what I’d like to make myself and also what I’d like to receive (I agree, pressies are great … except for having to find places to put them all!!!). 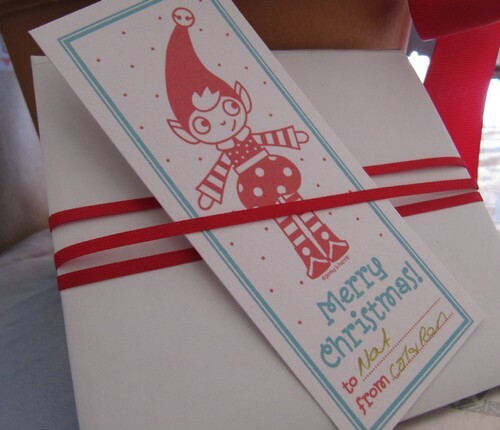 I seriously ran out of time this year – the social calendar was a little hectic, silly of me really. Meant that I had absolutely no time to spend in the kitchen knocking up edible delights for my nearest and dearest. We did all the cooking and packaging on Christmas eve, just made sure we chose easy things to make! I have bigger ideas for next year given I’ll be at home still, but we’ll see if they come into fruition!